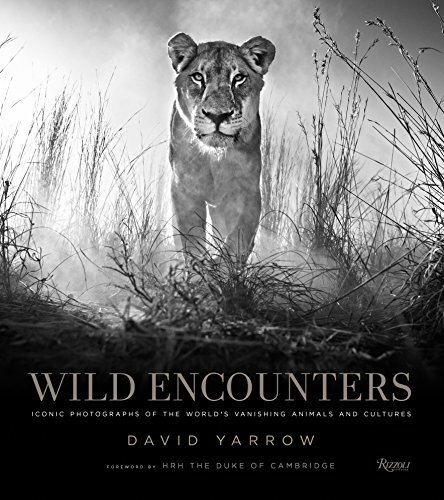 Wild Encounters: Iconic Photographs of the World's Vanishing Animals and Cultures est le grand livre que vous voulez. Ce beau livre est créé par David Yarrow. En fait, le livre a 336 pages. The Wild Encounters: Iconic Photographs of the World's Vanishing Animals and Cultures est libéré par la fabrication de Rizzoli. Vous pouvez consulter en ligne avec Wild Encounters: Iconic Photographs of the World's Vanishing Animals and Cultures étape facile. Toutefois, si vous désirez garder pour ordinateur portable, vous pouvez Wild Encounters: Iconic Photographs of the World's Vanishing Animals and Cultures sauver maintenant. From big cats to elephants and indigenous communities, Wild Encounters is a must-have for nature lovers, conservationists, and anyone who is inspired by all that remains wild. David Yarrow travels from pole to pole and continent to continent to visit frozen Arctic tundras, vast African deserts, primordial rain forests, and remote villages, inviting us to truly connect with subjects we mistakenly think we have seen before. Yarrow takes the familiar—lions, elephants, tigers, polar bears—and makes it new again by creating iconic images that deliberately connect with us at a highly emotional level. For more than two decades, this legendary wildlife photographer has been putting himself in harm's way to capture the most unbelievable close-up animal photography, amassing an incomparable photographic portfolio, spanning six continents. Driven by a passion for sharing and preserving Earth's last great wild cultures and species, Yarrow is as much a conservationist as a photographer and artist. His work has transcended wildlife photography and is now collected and shown as fine art in some of the most famed galleries around the world. Featuring 160 of his most breathtaking photographs, Wild Encounters offers a truly intimate view of some of the world's most compelling—and threatened—species and captures the splendor and very soul of what remains wild and free in our world through portraits that feel close enough to touch.